Anyone else go without a real table for a long time and then go into non-stop tablescape mode once you got one? Because that’s where I am at the moment. I put together a third Christmas tablescape for the season using pretty basic pieces. This would be easy to whip together if you’re hosting any sort of Christmas gathering in the new few weeks. Today’s post is part of the 2nd annual Virtual Holiday Cocktail Party hosted by my friends Vicki and Jenn from 2 Bees in a Pod. You can see all sorts of tablescapes, cocktail recipes and appetizers – basically everything you need for a party – from the other bloggers all linked at the end of this blog post. If only this was a real cocktail party, yes? This time of year is nuts, and we could all use a drink. Speaking of, if you were around last year, you may recall I put together a post on setting up a holiday cocktail bar, which is definitely a fun one to check out if you haven’t seen it! If you’re stopping over from one of the other bloggers’ posts, welcome to Green With Decor! You can learn more about me and the blog here or tour our house here. We just built our farmhouse dining table (tutorial here), so we need to stock up on placemats and table runners and such. In the meantime, I’ve been using this lace scarf and honestly, it looks so good on the table, I might just keep it up. I split up a festive grocery store bouquet between wine bottles and these little glass swing bottles. No joke, I needed another clear bottle to keep it even with two, so I dug one out of the recycling bin and scraped the label off. Does anyone what those green fluffy flowers are? I want them in the house all the time. Plus these flowers lasted for weeks, which is always awesome. I just love that evergreen and, those little red berries are so festive. I added some gold candlesticks and a few green ornaments and jingle bells to fill in on the scarf. Oh, I should also mention that our dining room is in the midst of a makeover. You can see the coastal room design plans here. We’re looking for a rug, a light fixture and chairs for the heads of the table, and we’re going to build benches for the sides. So that’s why there’s no chairs in these pics! We’re using folding chairs for now. We use those white appetizer plates year round, they work for just about everything! Those windows turned picture frames you can see in the background were the doors on a builtin in our Milwaukee house dining room. The gold birds are actually ornaments. They used to be my grandparents’, and I love adding little touches of theirs to our house during the holidays. The napkins are actually paper, nothing too fancy, but I love the ‘Wine a little’ on them so they work just fine. Remember to hop around to the other bloggers’ cocktail decorating and recipe posts below! Thanks, CoCo! The scarf is perfect as a table runner, haha! Have a great Christmas! Your table is so bright and festive! The greens are so pretty! Wow Meg – Your tablescape is just beautiful. Love all of your creative and special touches. The lace scarf is so very pretty and we love the gold ornaments. And can we just say how fantastic the dining table is?!!! Y’all did a fantastic job! Thanks so very much for participating in our annual hop. Wishing you and your family a wonderful Christmas! Thanks, ladies! We’re so happy with how the table turned out! Thanks for hosting the virtual cocktail party! Thanks, Maira – we love the table, too! It’s so beautiful Meg! I’m obsessed with your table and love how you integrated your grandparents ornaments into the tablescape! Thanks, Lydi! I love using their pieces at Christmastime! I love the ornaments in the wine glasses! What a great idea! 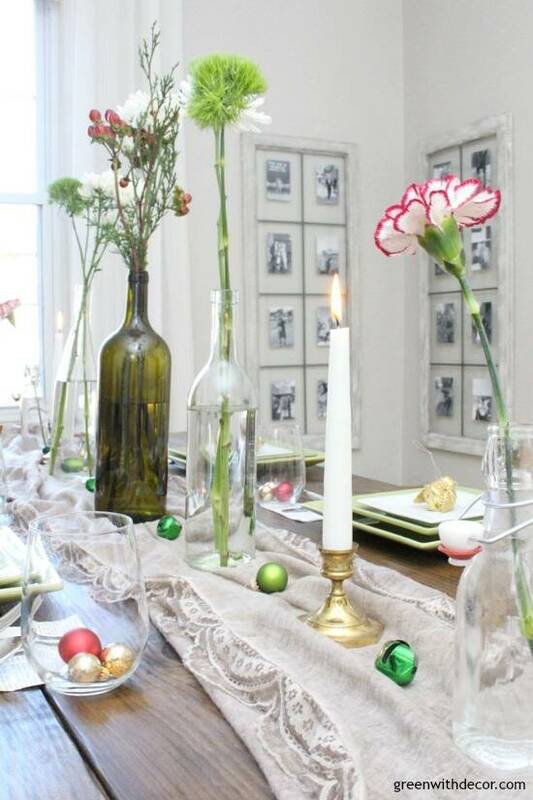 I have so many wine glasses that never get used so I am definitely doing this on my table! Thanks, Amanda – glad you can do it! It makes the table feel so festive! Using a pretty scarf as a table runner is genius!! Your tablescape looks wonderful on your new table! Thanks, Emily! I love the scarf on there! Your table looks so pretty! I love the doors in the background. What a great idea! Merry Christmas!